The Republic of the Congo, also known as Congo Republic or Congo-Brazzaville, is located in Central Africa. The first European explorers to reach the territory were the Portuguese in the late 15th century. However, direct colonization of the area began in the late 19th century. In 1880, France established a protectorate over the area north of the Congo River. In 1892, it was formally established as the colony of French Congo. In 1903, it was renamed Middle Congo. In 1910, the colony became part of French Equatorial Africa. During WWII, French Equatorial Africa supported the French government-in-exile led by Charles de Gaulle, and Brazzaville became a symbolic capital the Free France. The Brazzaville Conference of 1944 brought changes to the colonial system, granting the colonies semi-automony and giving citizens of the colonies equal rights with the French citizens. In 1958, French Equatorial Africa dissolved. 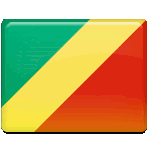 Middle Congo was renamed the Republic of the Congo and became an autonomous republic within the French Community. On August 15, 1960, it received full independence from France.